El dormitorio como ya saben, es el lugar en el que básicamente descansamos, pero también realizamos otras actividades. Por ello, deben ubicarse varios tipos de lámparas en este ambiente. Están las luces de cama, que sirven tanto para la lectura nocturna como para iluminar tu camino, es por ello que debes asegurarte de instalar el interruptor de apagado y encendido al alcance de tu mano. Para lograr este cometido puede optar por los dicróicos. Actualmente hay incandescentes de 75 W que reemplazan a un dicroico de 30 W, tambien se usan leds porque consumen menos energía. De igual modo, para iluminación general, dos luces empotradas en el techo constituyen un buen complemento para los puntos de lectura. 2) La luz artificial más efectiva debe ser tan suave y sutil como su contraparte natural para un dormitorio de descanso. 3) El color de las paredes del dormitorio afectará a la iluminación que se necesita, por lo que deben tener en cuenta que los tonos oscuros absorben la luz y colores claros lo reflejan. Espero que hayan disfrutado de los videos de arriba, que nos dan tips para iluminar la habitación, además se muestran fotos de habitaciones bien iluminadas con lámparas de bajo consumo y nos explican que aparatos existen actualmente para iluminar las recámaras. Preguntando a algunos amigos, muchos prefieren la luz amarilla porque es más cálida para descansar, pero otros prefieren la luz blanca para el dormitorio, es cuestión de gustos. El video nos enseña a saber que usar, si luz cálida (amarilla) o luz fria (luz blanca). - Segmento micro iluminación Arq. Patricia Molaioli en Programa "En Obras" canal 10 de Córdoba - Argentina. Iluminación de dormitorios. Fecha de emisión programa: 9-8-08. -Programa "En obras" emitido el día 29 de Marzo de 2008 por canal 10 de Córdoba. Temperatura de color, cómo actúa la luz sobre los pigmentos. 2) the most effective artificial light is as soft and subtle as its natural counterpart for a relaxing bedroom. The first step is to decide how much you would like to spend on artificial lights. There is a diverse range of models from which to choose. At one level, competitively priced models can be sourced from a local hardware shop, and at the other a lighting designer could be commissioned to plan and install the latest technological developments. - Have a good mix of task and background lighting so you won’t leave the house with one brown shoe and one black shoe. - Tungsten and halogen are the principal types of light used in the bedroom. Tungsten is a traditional, soft, and gold-tinted light, while halogen light is newer, crisper, and whiter. Comparatively, tungsten light is perfect for warm background lighting, while halogen works well in low- and main-voltage lights. It is especially suitable for task lighting, often working better than traditional tungsten lamps for reading in bed, particularly in fittings mounted on the wall or attached to the bed head. The bedroom below illustrates the benefits of both ambient lighting and task lighting; behind the bed is a window with a white blind that creates soft, diffused light while the bedside lights on either side provides a task lighting and a pleasing symmetry to the scheme. 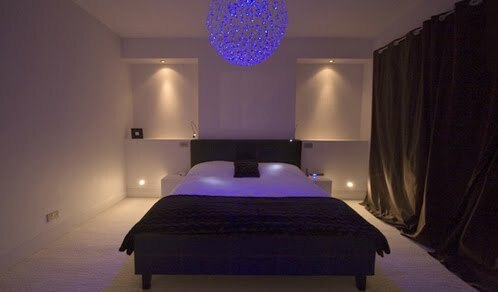 Dim it – Try not to have too many lights in the bedroom. Sometimes all you need to prepare fo bed are soft lights from matching bedroom lamps. Blind it – When natural light gets too bright, like the tropics, use well-designed blinds to diffuse and control the light. Light color - The color of the bedroom walls will affect how much lighting is needed, so bear in mind that dark tones absorb light, and pale colors reflect it. Bed switch – Just as you can switch lights on at the door, you should also be able to switch them off from the bed. This is to prevent the need to get out of bed prior to nodding off. Center light – If the bedroom has a center light, take the time to find a shade that fits the atmosphere of the room. Chandelier bright – Drop chandeliers are available in many designs and back in fashion. Use them to inject an atmosphere of frivolity and femininity into any bedroom. Starry night – For slumber under ‘starlit nights’, try this: fibre optic lights light with Swarovski crystals replicate the night sky. Panels on both sides of the bed enhances the effect and also provide light for play and reading activities. Face forward – Lighting at the dressing table should be soft and even. Ideally, the light should be placed above the mirror, on both sides, or even all around like Hollywood lights. Use halogen and incandescent bulbs over fluorescent ones. Note from bedroom lighting tips: when applying make-up, what looks just right under halogen lights will seem heavy in fluorescent light and vice versa. Private reading – For reading in bed, use an adjustable glare-free wall-mounted lamp that casts the light where you want it, so you don’t disturb your sleeping partner. A table lamp with an adjustable arm and shade will also do. Just make sure the lamps are compatible with your room decor. Hola Patricia, no tienes nada que agradecer, al contrario, felicitaciones por tan buen video que compartes en Youtube para aquellos que nos encanta la decoración.